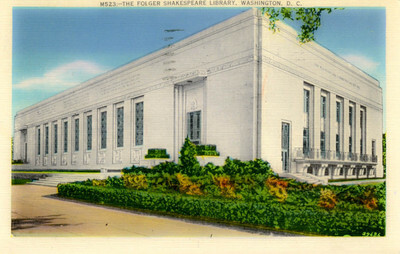 "The Folger Shakespeare Library - Washington, D.C."
The Folger Shakespeare Library - Washington, D.C. The Folger Shakespeare Library - The Folger Shakespeare Library was bequeathed to the Trustees of Amherst College by Henry Clay Folger of the Amherst Class of 1879, and has a $10,000,000 endowment fund. The white marble building is a treasure house; within the protecting walls is the "finest collection of Shakespeariana the world has known,: including more the 70,000 volumes, as well as pictures and other relics. Linen postcard with divided back published by B.S. Reynolds Company, 918 D Street, Northwest, Washington, D.C. and printed in the United States by Metrocraft, Everett, Massachusetts.